This document describes how to use GreenArrow Engine’s web interface to add a new sending IP address. To update these settings by running SQL queries, see the Updating Throttle Settings in SQL page. There are additional non-GreenArrow specific steps, described in the Adding a New IP Address FAQ page. Login to the GreenArrow Engine Web Interface. IP Address - the new IP address. Hostname - the reverse DNS record that was created for the new IP address. 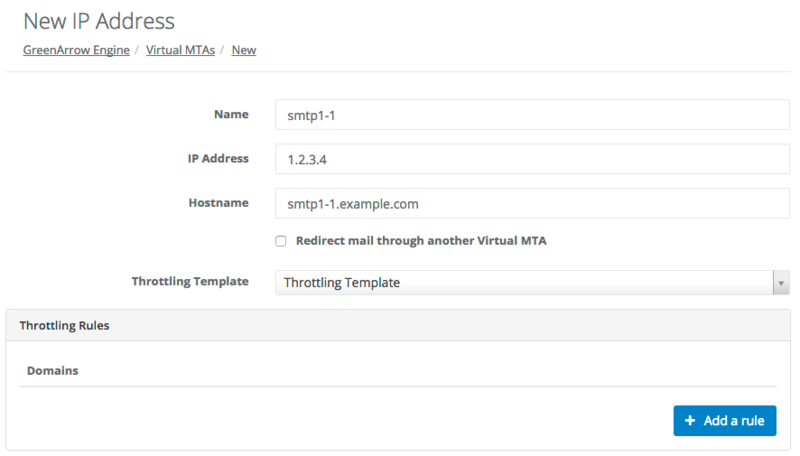 Throttling Template - select the desired throttling template. Each throttling template contains one or more throttling rules to apply to the IP address. Throttling Rules - you can add any desired throttle overrides to this section. 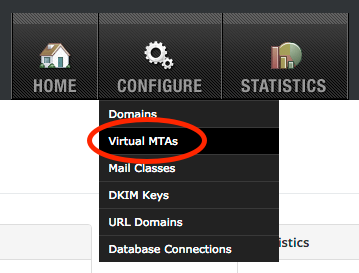 These overrides will apply to just this IP address. When configuring DNS, use the public IP address, rather than the private IP address, since this is what recipient servers will see when your GreenArrow Engine server is sending messages. When filling in the Add IP Address form, the Hostname to enter is the reverse DNS record for the public IP address, rather than the private IP address, since this is what recipient servers will see when your GreenArrow Engine server is sending messages. When filling in the Add IP Address form, the IP address to enter is the private IP address, since this is what was assigned to your Linux installation’s networking configuration. This private address probably starts with10., 172., or 192.168..
Add all public and private IP addresses to the /var/hvmail/control/replaceipme file. This file contains a list of IP addresses that this server should not deliver mail to on port 25. If this file is missing, the default list contains all of the IP addresses locally assigned to the server. No step is required to apply changes to this file.